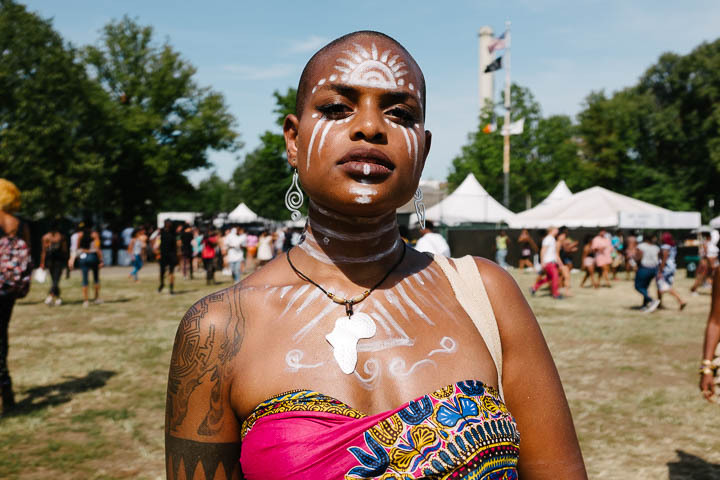 I've been meaning to shoot Afropunk for years now. 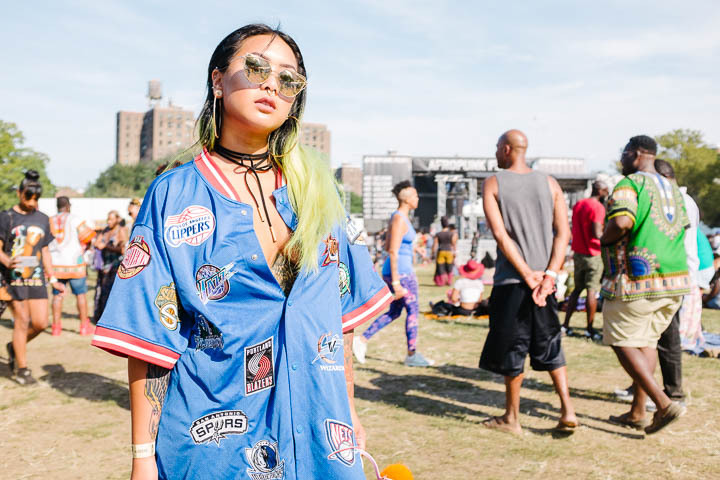 The Brooklyn-based alt-culture fest has become something of a street style phenomenon. All the major fashion outlets cover it—Vogue, Elle, W, The New York Times. 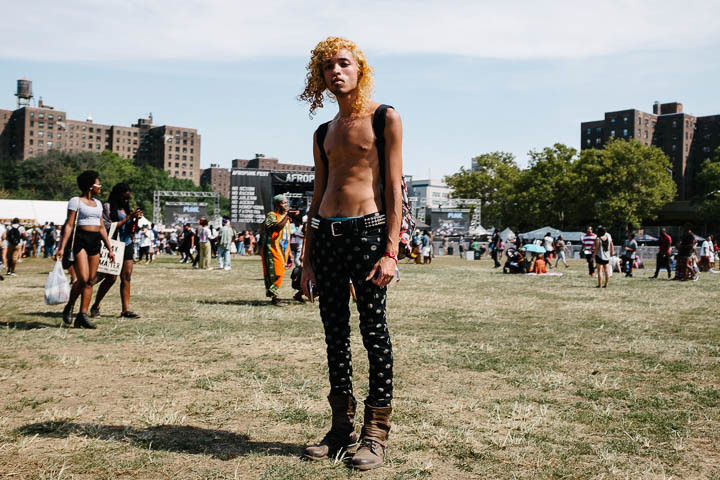 In fact, it reminded me a little of what the New York Fashion Week street style scene was like when I first started shooting it for Spring Summer 2013 in September of 2012: a motley crew of sartorial oddballs, unafraid to let their freak flags fly. There was, back then, a palpable sense that if you just dressed up and showed up anything might happen. 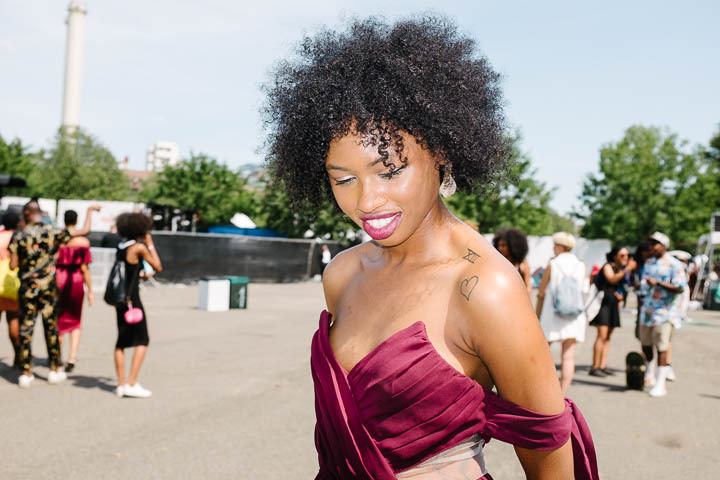 Bloggers and newbie influencers hung out for hours at Lincoln Center, taking pictures of one another, networking with other bloggers and influencers. Fashion Week only barely belonged to the fashion industry. 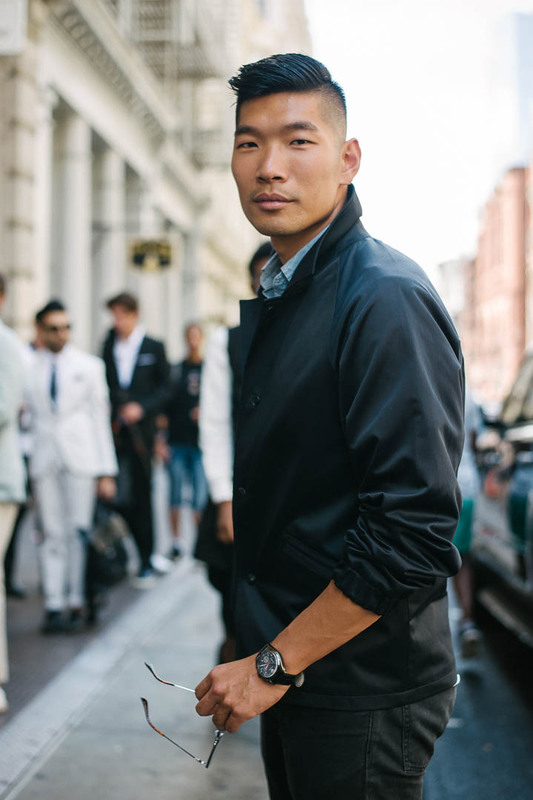 That sense of possibility gradually eroded as Fashion Week spread to more and more disparate parts of the city, and the main venue moved to 33rd Street where there is nowhere for the industry outsiders to gather. 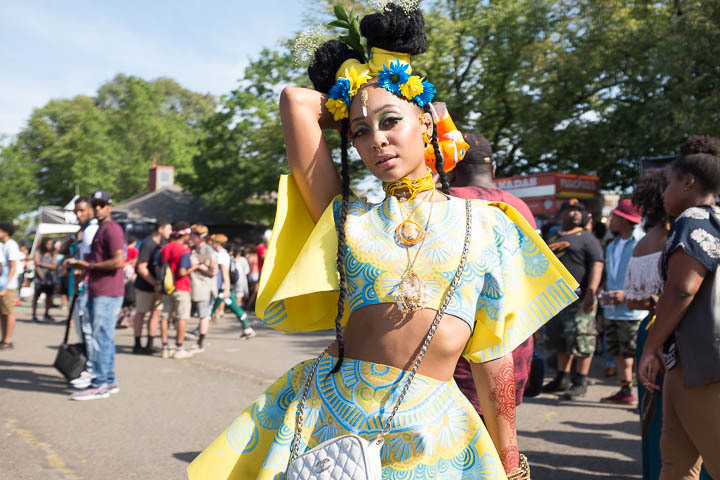 Today, festivals are the new Fashion Week. Bloggers and social media stars abound. Some, I am guessing, get paid just to attend. And the photographers show up to document them. When I first arrived yesterday, at around 1pm, there were nearly as many photographers as attendees, scouting the crowd for cool kids with presence. Many I recognized from Fashion Week, including several friends of mine. They were shooting for publications as disparate as Refinery 29, W, i-D, and The New York Times. Several hours later, it had grown too crowded to set up interesting shots. Photographers starting hanging out, dancing, actually paying attention to the music. But it's not like the pros were the only photographers there. Nearly everyone brought a camera along, even if it were just an iPhone. And many of them asked others to pose for them, packs of roving amateurs hoping to gain followers to their Instagram accounts. 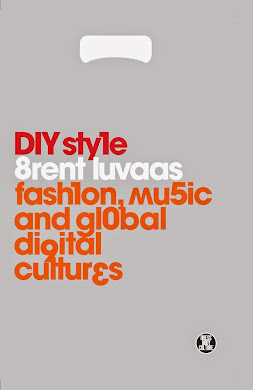 At my more cynical moments, I wondered whether festivals these days are exclusively about fashion. Few people for the first few hours went anywhere near the stages. The musicians were ancillary to what appeared to be the main event: social media networking. But those were my more cynical moments. At other moments, I was dazzled by the beauty and diversity of the crowd. And their incredible stylishness. 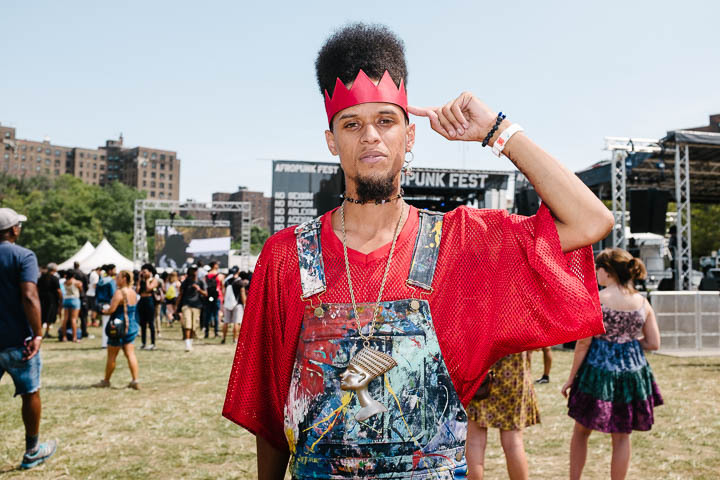 Afropunk is helping redefine urban youth style: a mixture of punk and hip hop, hippy, and skinhead. 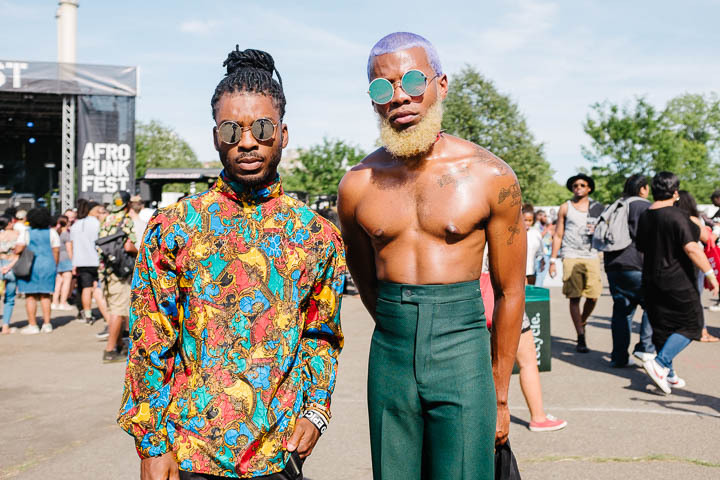 The inclusive brand of Afro-centrism that Afropunk promotes is infectious. 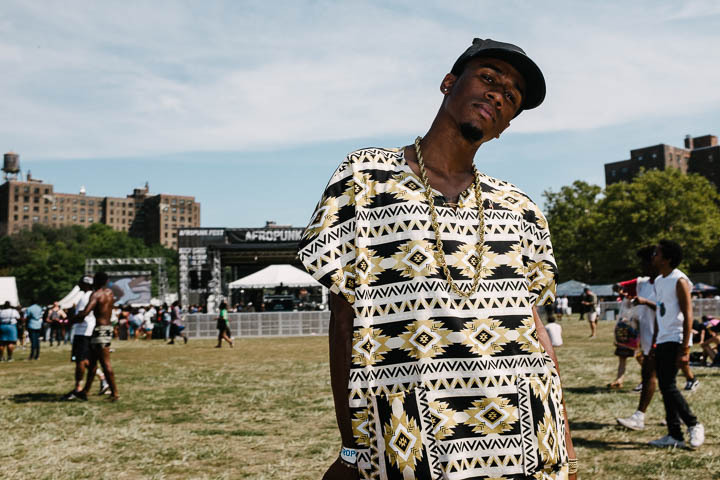 On big banners throughout the event, Commodore Barry Park in Downtown Brooklyn, were a litany of prohibited prejudices: No racism, no sexism, no ageism, no ableism, no homophobia, no transphobia, no hatefullness. This, I think, is becoming a generational mantra. And it is gorgeous to observe in practice. I wish I had documented the diversity of styles even more completely than I did. Five hours in the relentless sun, filling up my "Just Water" water bottle at the free water station several times, was just about all I could take. Plus, I was shooting with my street photography camera (my Fujifilm X100T), not my usual street style photography camera (Nikon D700 with an 85mm lens). 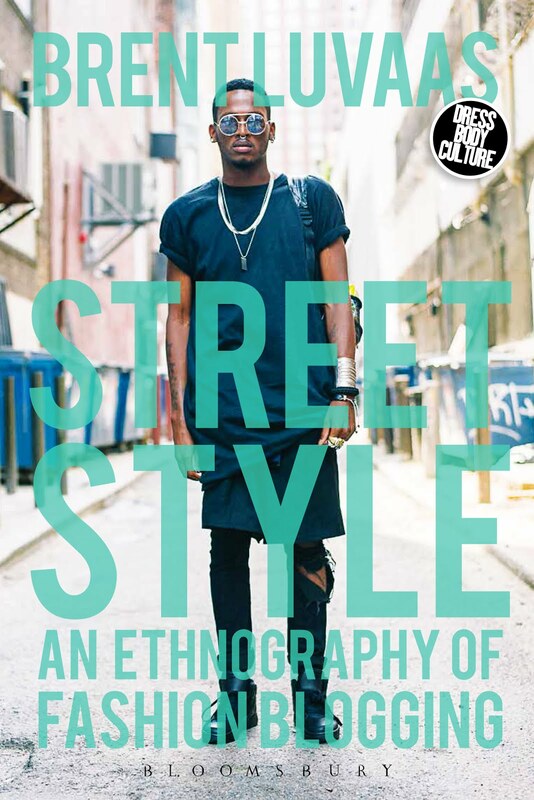 It prevented me from getting that beautiful bokeh (background blur) that defines my typical street style work. I had to mix up my aesthetic. 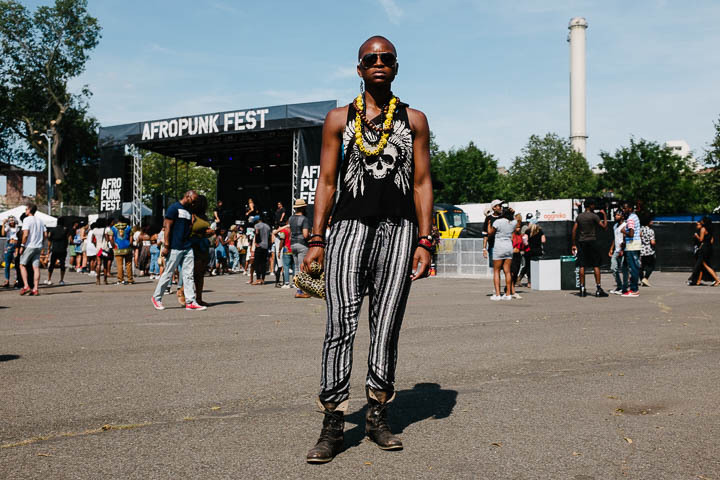 The Afropunk website insisted I leave my "detachable lens" camera at home. 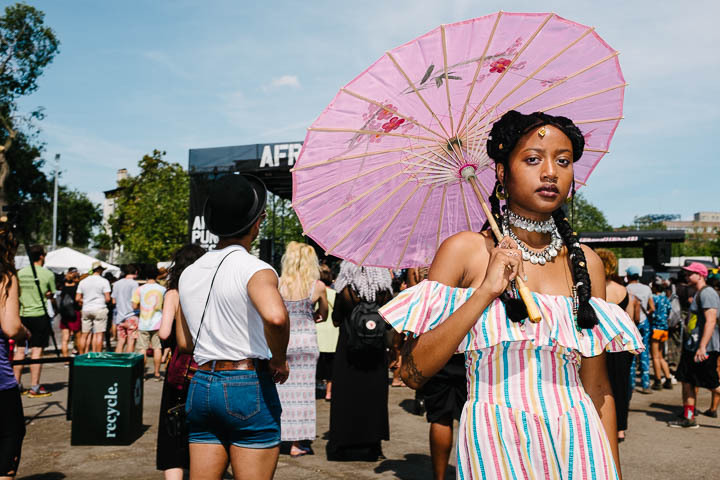 Now that festival style has become a fashion industry obsession, Afropunk wants to control its own representations. So they hired a good friend of mine to shoot it. She was in constant motion throughout the day, a posse of interns and a video crew surrounding her. When she wasn't shooting street style, she was taking tin types of the artists backstage. 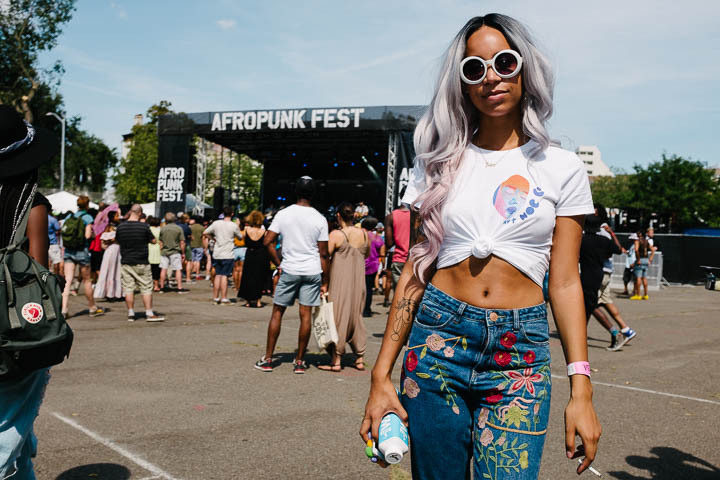 How to reconcile Afropunk's commercial viability with its anti-commercial punk ethos? That's always the question with punk, isn't it? 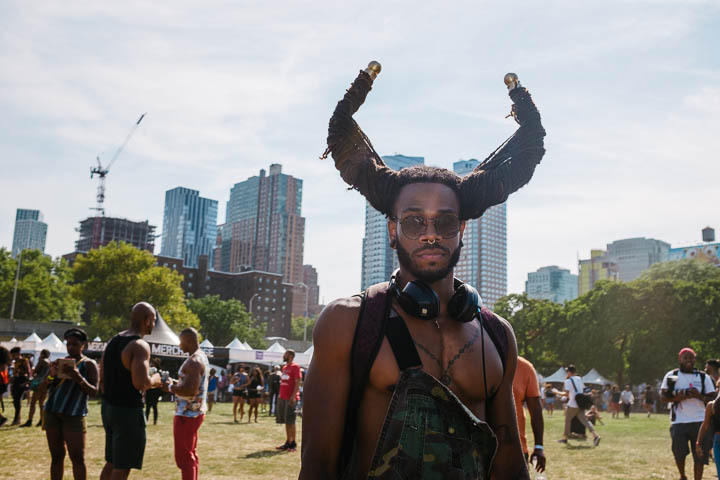 Afropunk's approach is straightforward: stifle it with strangeness. 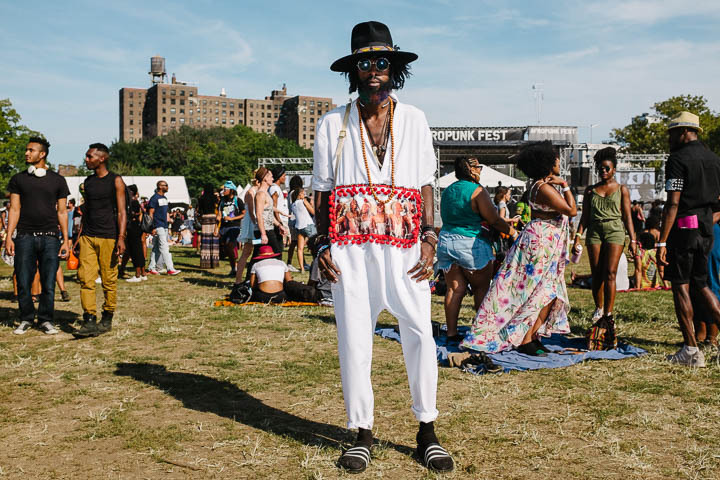 If there is a shared sartorial sensibility at Afropunk, it is one that matches the festival's stated, anti-hate policies; one of radical inclusiveness. Don't leave anything out. Except, that is, the bro-ish baseball cap-clad normality that defines most festival style. 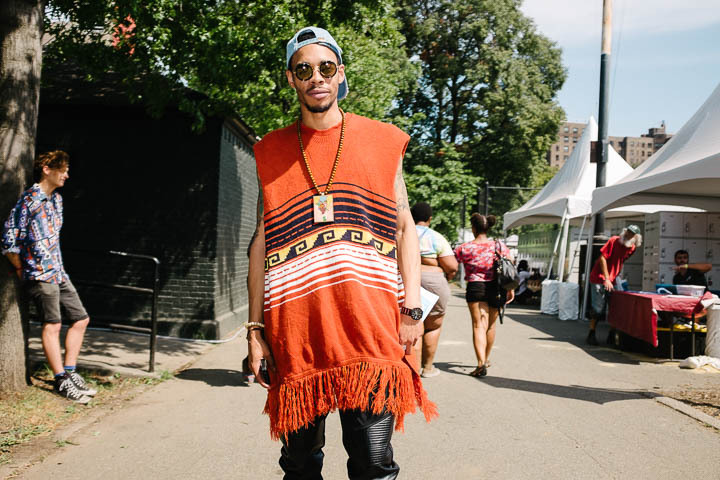 There was a decisive shortage of boring white bros at Afropunk. Baseball caps would have ruined the hair! 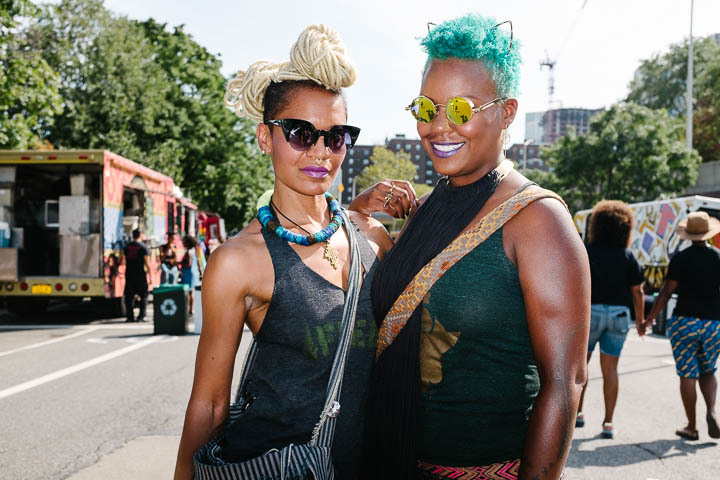 And if you're going to name your festival Afropunk, you better attract people with some amazing hair! They managed to do that. 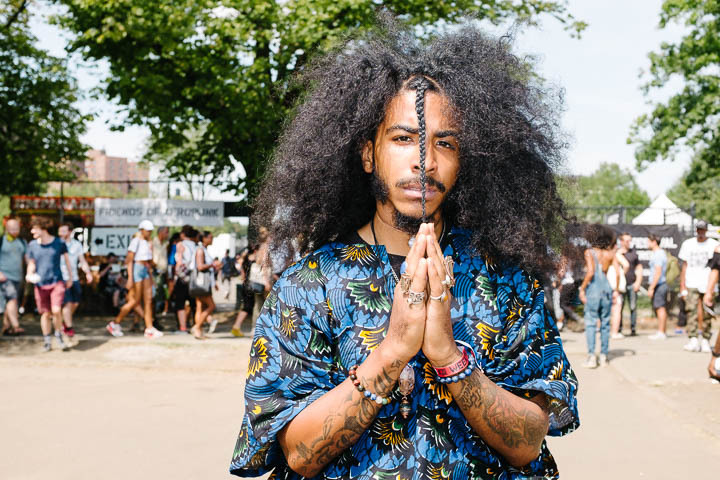 Afropunk is a master-course in natural—and profoundly unnatural—hair.